Rainbow Fish has an ego problem. He cannot imagine anyone more special than him. He snubs ordinary fish who try to get his attention, he doesn’t understand when he’s being rude or insulting, and he abhors the idea of sharing. In short, he’s a spoiled brat. The Bay Area Children’s Theater takes the core of Marcus Pfister’s book and puts its own expert twist on the story. 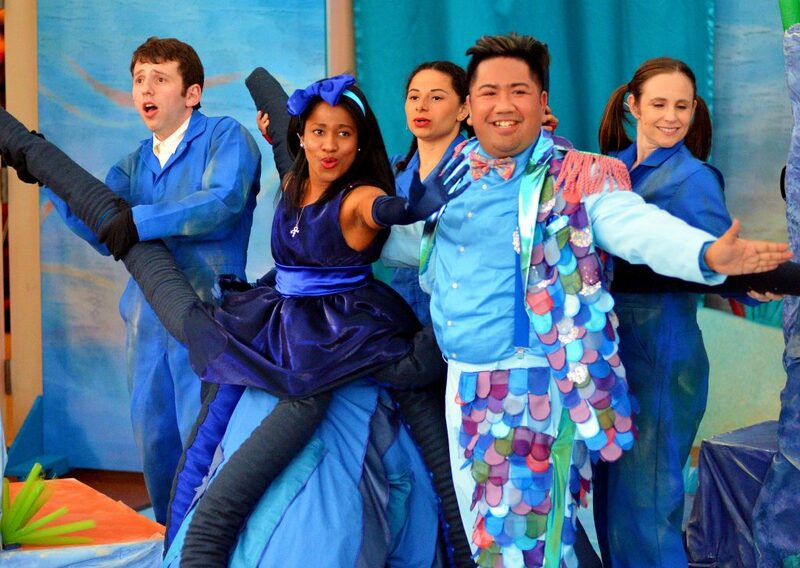 Director Hannah Dworkin and writer Austin Zumbro bring a cast of ocean characters to life in charming musical detail, right down to Rainbow Fish’s one-of-a-kind scales. The drama is driven by a question asked by the innocent, well-meaning Little Fish (an energetic Dworkin). Little Fish asks Rainbow Fish (Neal Pascua, who channels Elvis in his dance moves): “Could I have one of your amazing scales?” The request prompts a tirade from Rainbow Fish—a tirade witnessed by two socialite fish who have just invited the most beautiful fish in the sea to a fancy party. When Rainbow Fish shows up to the party, he isn’t welcome, because he’s acted so rash and so rude to Little Fish. He tries to make amends by visiting Little Fish and her friends at her school. The result is a disaster. Rainbow Fish is only happy when he is the center of attention. But the other fish refuse to play the role of his silent adoring fans. 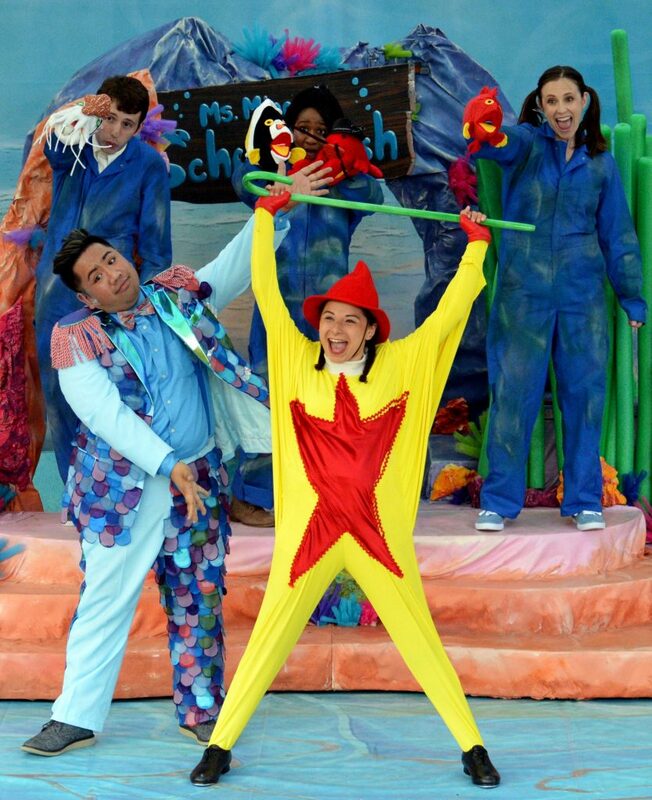 Down in the dumps, Rainbow Fish pours his heart out to Starfish (multi-talented Alicia Piemme Nelson), who provides comic relief throughout, cracking jokes and then flopping on the nearest rock to do what starfish do. Starfish suggests that Rainbow Fish travel to a deep, mysterious cave beyond the reef—to ask the wise Octopus how to change. Octopus (the vibrant, compelling Angel Adedokun) uses her lovely voice to deliver sound advice. Members of the Ensemble bring Octopus’ costume alive as she sings, transporting us with a magical scene. 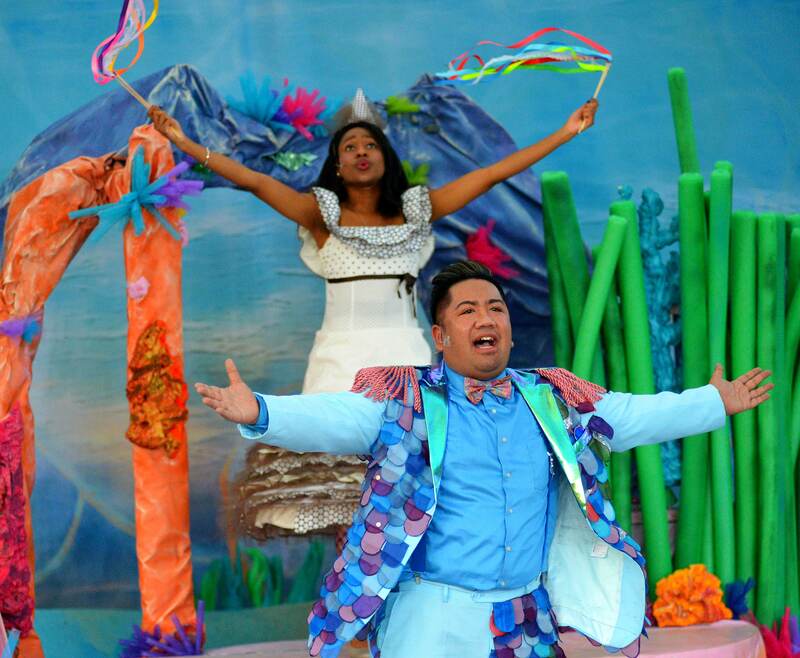 The music, actors, set, props, and sound effects keep toddlers riveted every moment of this 45-minute show, which is performed in a small outdoor amphitheater in the heart of Children’s Fairyland at Oakland’s Lake Merritt. You might want to bring a cushion for the seats, as they are hard and designed for children with short legs. Zumbro crafts his songs and dialogue to engage kids and adults alike. These actors erupt with the energy of volcanoes, dancing in sync, jumping with excitement, and collapsing to the floor in tantrums. The cast sings their hearts out, often directly to us. The tickets may seem pricey considering the short run time, but a ticket also buys you admission to Children’s Fairyland, so plan ahead to take advantage of both. Another way to soften the ticket price is to come on a Friday night. BACT is handing out a free slice of pizza ahead of Friday night shows, so parents don’t have to worry about dinner. This particular parent had to keep whispering to her toddler to eat her dinner, because her eyes were glued to the stage. The slice in her hand was invisible until she was back in her car seat and we were headed home. Clutched in her other hand, a sparkling scale, from the Rainbow Fish himself, swinging from a blue cord. “I’m going to put this in my special jewelry box,” a girl dressed as a princess said on the way out, admiring her Rainbow Fish scale necklace. BACT leaves audiences with a souvenir that embodies the message of the production in a heartwarming final scene. After Oakland, the production moves to Creativity Theater, at Children’s Creativity Museum, in San Francisco, from August 11-27, 2017. Cast: Angel Adedokun, Hannah Dworkin, Pablo Hamlin, Isabel Ito, Alicia Piemme Nelson, and Neal Pascua.